1. Pour 400ml boiling water over the couscous. Stir in the sultanas and seasoning to taste, cover and stand for 10 minutes. 2. Mix the flour with the cinnamon and dust the chicken breasts with the cinnamon mix and the freshly ground black pepper. 3. Heat a large, non-stick frying pan and dry fry the chicken for about 5 – 6 minutes each side, until thoroughly cooked (the juices should run clear and there should be no pink meat). Transfer to a plate and keep warm. 4. Return the pan to the heat, add the stock, vinegar, the juice from 1 orange and 2 tsp finely grated orange zest. Bring to the boil, then simmer gently for 5-6 minutes, or until it has reduced by about half. 5. Peel the remaining orange and cut into segments. Boil the sugar snap peas in water for 2 minutes, then drain. 6. Add the chicken, sugar snaps and orange segments to the sauce. 7. Stir the couscous with a fork and add the parsley. 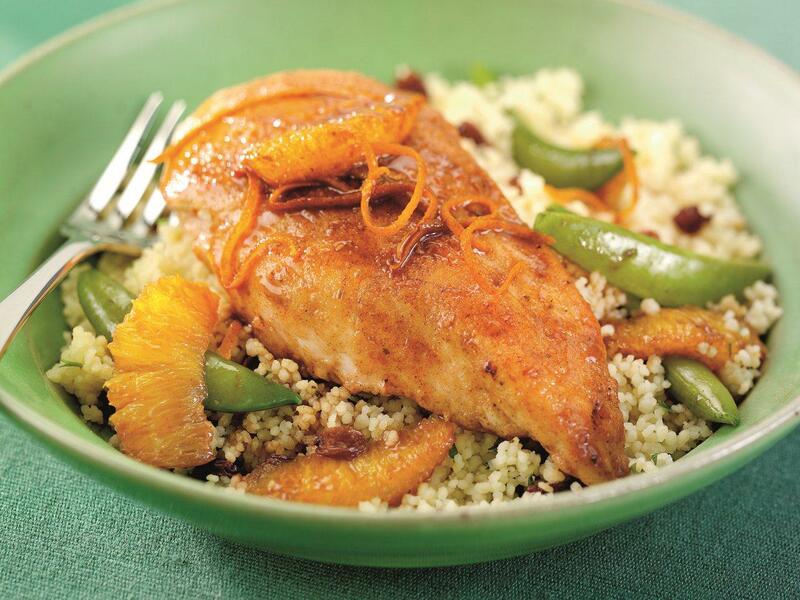 Serve the chicken on a bed of couscous. You may want to try my chicken stir fry recipe or my chicken balti recipe. For a dinner party, I recommend my Persian chicken stew with walnut and honey sauce. Do you have an interesting chicken recipe to share?